GLR Tashina is just about a cute as they come and a ranch favorite for sure. Her mother GLR Tashi was the first offspring of our multiple champion GLR Tica, one of our first Shavano daughters. Tica won one of the first judges choices as a colored suri during her career. Tashi was sired by our 5 time White Color Champion Young Felipe. 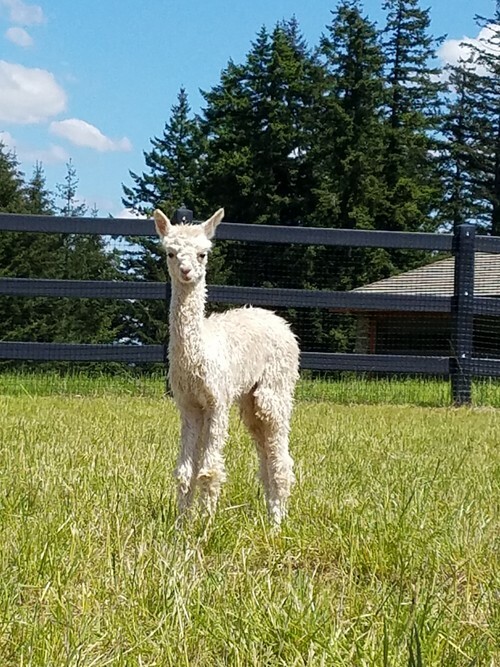 GLR Kolaqua, Tashina's dad, was a two time AOBA Nationals Grey Male Color Champion and has produced some of our best cria in the past few years. Tashina is dense, incredibly lustrous and has a great "show ring presence" along with great density, lock and a beautiful little suri head. She is a favorite to turn heads with her crazy and beautiful colored fleece. Her initial micron test was 19.6. With her colored genetics and great fiber characteristics both in person and in her pedigree, it will be fun to see what she produces. At only 7 months old she won Reserve Grey Female Color Champion at both the AAA Futurity and MAPACA Jubilee and went on to place second in her class as a juvenile at the 2013 AOBA Nationals. Tashina was the Grey Female Color Champion at the 2014 AOA Nationals, the AAA Futurity and MAPACA. She ended her show career with being selected as the MAPACA Jubilee Judges Choice. She is bred to Cinders for a fall cria and we can't wait to see the results of that breeding! GLR Tanah is the daughter of GLR Tashina, the very first grey ever to be awarded a Judge's Choice. Tashina was the 2014 AOA, AAA Futurity and MAPACA Grey Female Color Champion. Tanah is one of her sire Cinders' second crop of kids. Cinders made some waves with his first crop of kids in the show ring in 2014 and we eagerly awaited to see how this group of crias developed in 2015. Tanah even as young as she was her first season now showed us the kind of promise we saw in her mother. 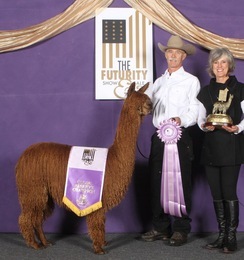 Her first show was at 6.1 months old at the AAA 2015 Futurity when she placed 2nd and was the youngest alpaca in her class. she was second again as the youngest in her class at the MAPACA Jubilee. 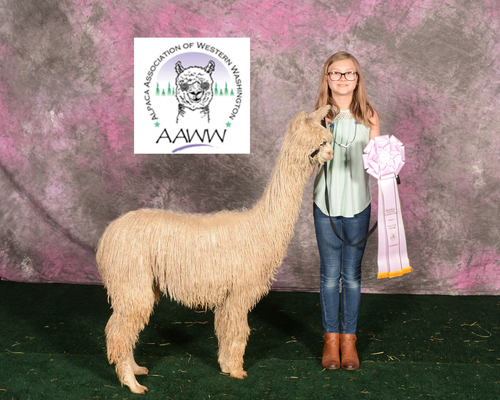 She wintered and matured well in 2015 and was Reserve Brown Female Color Champion at the 2016 AOA Nationals, the AAA Futurity, and Brown Female Color Champion at the 2016 MAPACA Jubilee. She is bred to Lazy G's Accoyo Goldstar and expecting her first cria in summer of 2017. Can't wait to see that combination! Tanah had a beautiful beige girl by Lazy G's Accoyo Goldstar on 5/3/17!